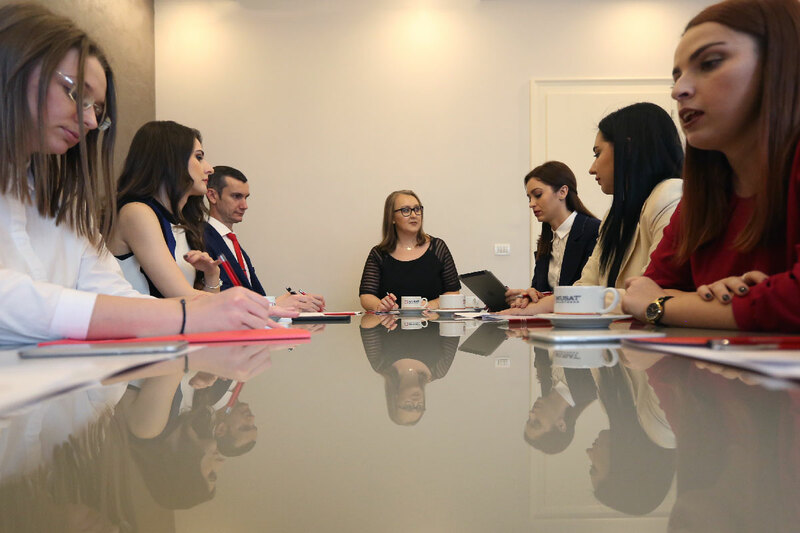 We are a team of young enthusiastic proactive lawyers, always ready to provide legal solutions, strategies, rapid and efficient recommendations in the most varied concern domains for your company. We have the courage to apply the best legal strategies for our clients and to do everything possible for winning. We never give up! We understand our clients and their needs. We get involved! We promptly and seriously work for our clients. We win due to our competence. We work as a team not only within our practice, but also together with our clients. We provide legal consultancy and assistance to our clients, as well as representation before courts of law and public authorities and institutions, due diligence services and the possibility to create partnerships with professionals from other domains (notaries public, accountants, auditors, judicial executors, bank counselors, and sworn translators). We have the courage to apply the best legal strategies for our clients and to do everything possible for winning. We never give up! We understand our clients and their needs. We get involved! We promptly and seriously work for our clients. We win due to our competence. We work as a team not only within our practice, but also together with our clients. We provide legal consultancy and assistance to our clients, as well as representation before courts of law and public authorities and institutions, due diligence services and the possibility to create partnerships with professionals from other domains (notaries public, accountants, auditors, judicial executors, bank counselors, and sworn translators). Our mission is the success of our clients! Professionalism is synonymous to excellence, and for us the excellence is not a singular act, but a custom. That is why the professionalism is one of the values characterizing us the best; it relies on the experience of our team members in the most varied law domains. Transparency is for us the honesty we provide in the relation with our clients and that separates us and proves the high value of our team. Promptness we guarantee while supplying our services is seen in the importance we grant to your business. Time is valuable. Count on us! We care for your time! Involvement our team proves is found in the connection we maintain with our clients and in the promptness our team uses when always meeting their requests. Integrity for us means unity and legality. The credo of Musat & Partners team is to observe the ethical principles and values of the lawyer profession. Strict ethical principles and an internal professional behavior code ensuring the transparency and independency of our services govern our work. Our team consists of professionals experts in various legal fields, facing the highest professional exigencies. We offer customized and optimized solution for the protection of our customers' rights and for the representation of their interests. Square is a semi-aggressive geometrical shape showing security, stability, trust, and it expresses the transparency, as clear as possible, which is one of the main assets of our company. The three lines symbolize the energy of the company. The impetus, fair competition and dynamism sare represented by the ascending direction. The result of the merger between the two symbols expresses the main values of the company: transparency, seriousness, energy, and openness.